Lykke Li: Bolder, But Still 'Wounded' Fans who discovered the Swedish singer's vulnerable voice on a Twilight movie soundtrack might be surprised to hear her more provocative sound on the new Wounded Rhymes. 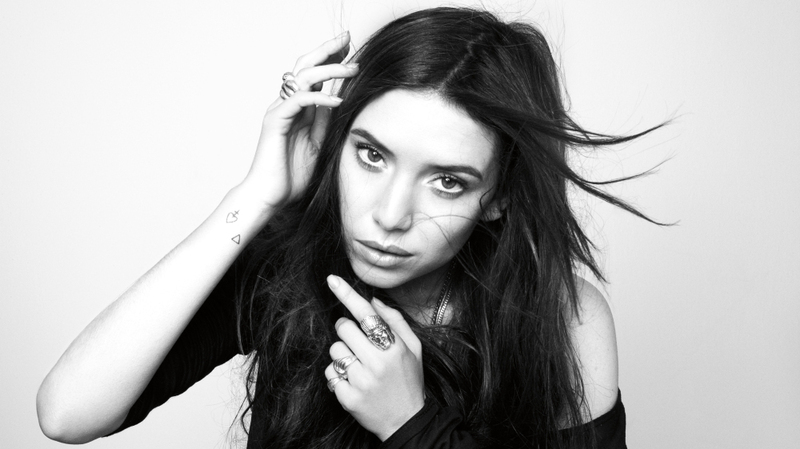 Lykke Li's new album, Wounded Rhymes, has a bold, provocative sound. For the millions of teens (and, let's face it, adults, too) who follow the Twilight movies, music is a key part of the experience. The soundtrack to New Moon, the second in the series of teen vampire films based on Stephenie Meyer's novels, features a song called "Possibility," in which a delicate voice sets the tone for a story of young love and yearning. That voice belongs to Swedish singer Lykke Li. But on her latest album, Wounded Rhymes, it doesn't sound quite so delicate. "It's all about being free and following my inspiration and what excites me," Li tells Weekend All Things Considered host Guy Raz. "I try not to censor myself. I just go with my own gut feeling." That approach is apparent on the song "Get Some," which contains a lyric that has raised a few eyebrows: "I'm your prostitute / You gon' get some." Li says those offended by the line don't understand: "It's kind of shocking to be talking about power and to make a statement about how I feel being a woman in the music industry, and all of a sudden I'm labeled as a victim and a real prostitute," she says. On certain tracks on Wounded Rhymes, she pulls back, exchanging heavy beats for more organic sounds. For "Youth Knows No Pain," she says she wanted only real instruments and live takes, which led her to a Shangri-La-inspired 1960s feel. On other cuts, like "I Know Places," the approach lends itself to a very stripped-down arrangement. "I was watching this film called Paris Is Burning and this old drag queen talks about how hard life is, but then she says on the catwalk, 'But that's a high that won't hurt you,' " Li says about her inspiration for "I Know Places." "It's not about that, but ... it's about going to a place where the highs don't hurt. Because in real life, you have to pay your dues." The singer is a shape-shifter, always looking to develop a new sound or style. Her restless musical personality can perhaps be explained by constant movement as a child. Though she grew up in Sweden and Portugal, her family traveled through Morocco, India, Nepal, Thailand, America and New Zealand. Whether backed by booming beats or minimal acoustic instrumentation, Li's voice sounds surer of itself on Wounded Rhymes. She attributes this growth to feeling young and uncomfortable in the studio recording her first album. But even with danceable tracks, Wounded Rhymes takes plenty of dark turns. The singer says the more somber moments on the album are also representative of who she is. "I'm a very melancholic kind of person," she says. "I don't know why, I think certain people are born a certain way. There's more discomfort being an old soul or a person who questions a lot of things. I'm young, but I'm old. It's a part of who I am and the reason why I'm here, too." Li says she didn't necessarily understand the Twilight phenomenon, but she was grateful for the opportunity to influence young listeners watching the films. "[Twilight has] die-hard fans — all these young people still believing in love and being romantic. I really identify with that. I remember watching films in my teenage years, and you'd be in love with Leonardo DiCaprio and then a song would come on. You'd love that song forever; it changed your life." Asked what Wounded Rhymes will mean to her when she listens back to it, the self-described old soul thinks it will serve as a reminder of her growing pains. "I'm going to be like Benjamin Button; I'm just going to grow younger. I will probably be happy, fat, with kids and looking back and thinking, I was such a angry young woman. It's the dark years before I kind of understood that life is hard, but it's always beautiful."